PARIS — Notre-Dame remains structurally sound after the monstrous fire that roared through it Monday night, though the conflagration that destroyed the wood-and-lead roof and lacy spire also left three “holes” in the sweeping vaulted ceiling, officials said after an inspection on Tuesday. With the fire extinguished, officials began what the Paris prosecutor, Rémy Heitz, told journalists would be “a long and complex investigation,” though for now he said they were considering the disaster an accident. The nearly 50 investigators assigned to the case were focusing on interviewing workmen who had left the site but had been engaged in the restoration of the cathedral not long before the fire broke out. The first fire alarm on Monday was triggered at 6:20 p.m., and checks were carried out but no fire was found, Mr. Heitz said. A second alarm went off at 6:43 p.m., he said, and fire was discovered in the wooden framework of the attic. Whether the catastrophe could have been averted was a question now plaguing the officials, citizens and visitors who continued to congregate on the banks of the Seine River to contemplate the mutilated monument, an unequaled jewel of Gothic architecture. The investigators faced the difficult task of determining a cause in the apparent absence of evidence, destroyed by the roaring flames that erupted in the “forest,” the wooden frame of ancient beams beneath the lead roof. He said that there was also an on-site fireman at the cathedral, although he did not say how often, where that person was normally stationed, or whether that person was present yesterday. Whatever the cause of the fire, Parisians awakened to the new reality at the heart of their damaged capital: the city’s symbolic center damaged like never before in its more than 800 years of history, not by the furious revolutionaries who defaced it nor by misguided restorers who denatured it. “It’s exposed to the sky. It’s an absolute tragedy, beyond anything we could have imagined,” said Stephen Bern, who has served as an adviser on France’s monuments to President Emmanuel Macron. Mr. Macron made an immediate effort to heal the psychic wound, promising late Monday night to rebuild the cathedral, a beloved symbol of the city for more than eight centuries. Mr. Macron stood outside the still-burning structure and said an international effort to raise funds for reconstruction would begin on Tuesday. The billionaire Pinault family of France pledged 100 million euros, or about $113 million, to the effort, Agence-France Presse reported, and the family of Bernard Arnault, owners of the luxury goods group LVMH Moët Hennessy Louis Vuitton, plan to contribute €200 million. Meanwhile, belated vigilance continued. Gabriel Plus, a spokesman for the Paris firefighters, said Tuesday morning that the firefighters were still looking for “residual” flames that might need to be put out. 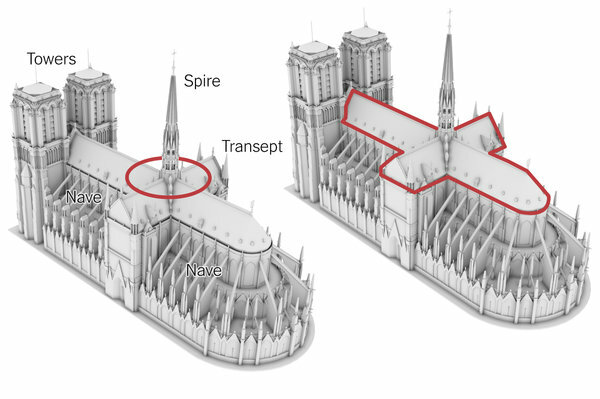 Mr. Plus, speaking to reporters near Notre-Dame, said experts were now going to examine the building’s structure to see how weakened it was. Two police officers and one firefighter were injured in the five-hour battle to gain control over the blaze, but no one was killed. Notre-Dame, which was built in the 12th and 13th centuries on the foundations of an earlier church and Roman ramparts on an island in the Seine, is visited by about 13 million people a year. Towering above the surrounding buildings, it is instantly recognizable to people around the globe as not only a religious landmark, but also a national, cultural and historical emblem of France. In addition to damaging the building itself, the fire put at risk its relics and stained-glass windows, with panes held together by lead that melts at high temperatures. While one treasure, a relic of the crown of thorns said to have been worn by Jesus during his crucifixion, was saved, the status of some other historic items is unclear. The architect who oversaw work on the cathedral in the 1980s and 1990s said he believed much of the building and its furnishings could be saved. Photos of the interior showed that many flammable fixtures, like pews and a pulpit, remained intact. “The stone vaulting acted like a firewall and it kept the worst heat away,” said the architect, Bernard Fonquernie. 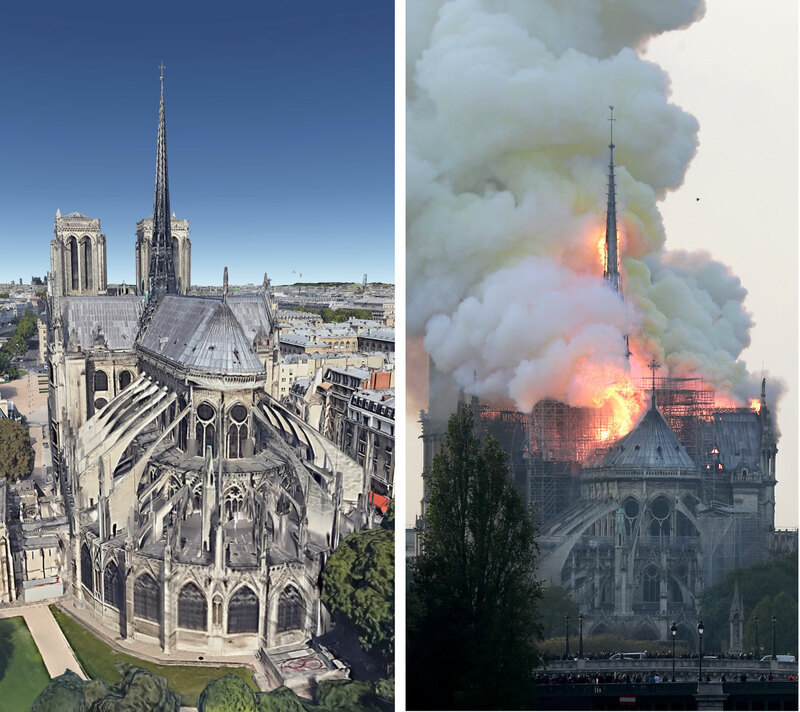 Stunned Parisians and visitors, along with countless people around the world watching live on television, looked on in horror as the cathedral, with its famous flying buttresses built to support the relatively thin and tall walls of its era, burned days before Easter Sunday services were to be held. Hundreds of bystanders gathered near Notre-Dame on Tuesday morning, many struggling to fathom what had happened. “I was stunned when I came to see the fire last night, and I’m still so shocked this morning,” said Serge Roger, a 67-year-old Parisian retiree. He watched firefighters spray water on the cathedral, some going in and out of the smoking building, while others pumped water from the Seine. “We Parisians need to talk about what happened to Notre-Dame, because we love it, we know it, it’s part of our daily lives,” Ms. Defranqui said. She had studied the cathedral’s architecture in art history classes at the Louvre, she said, and would marvel at its towers on her way back from the museum to her apartment on the Île Saint-Louis, the island next to Île de la Cité, where Notre-Dame is.